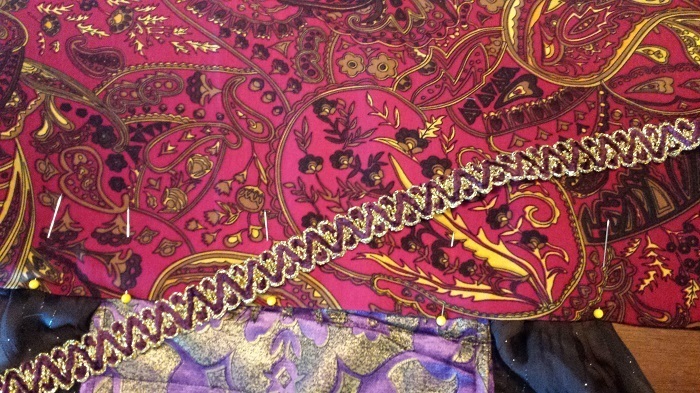 My current big project is a full set of ornate wizards robes for a good friend of mine. 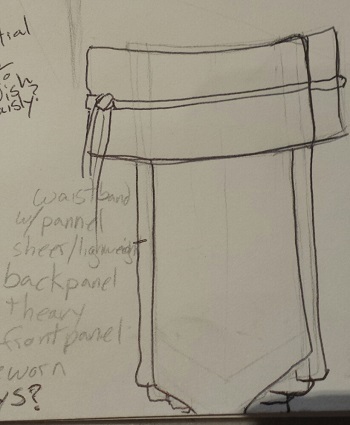 A key part of jumping the robes up a notch in the scales of grandiosity is sash or belt with dangly stuff! 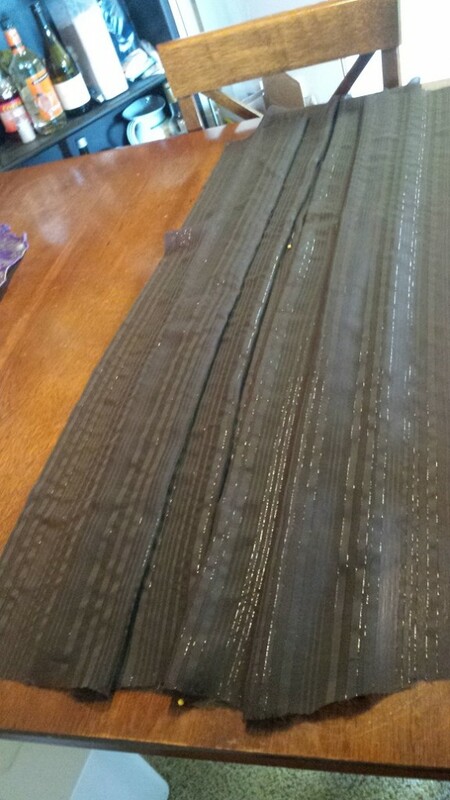 So while I have to wait to start on the robes proper for certain specialty fabrics to arrive in the mail, I can get a start on the belt. Slap this puppy on over even simple looking robes or generic fantasy tunic and pants and suddenly you’ll look like Fancy Pants Lord of Garishness! The color pallete I was given for this project was: Predominantly Purple, maybe some reds, and make it garish, but tastefully so. 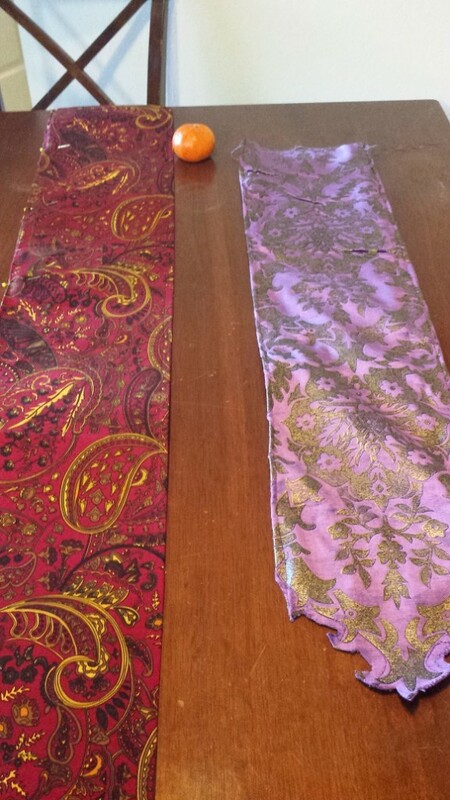 With the help of another good friend of mine we settled on these two as the predominant parts for the sash. The photos don’t quite do them justice. 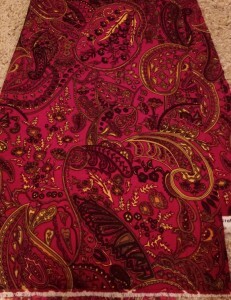 The red paisley is actually this deep maroon, and it’s almost a peach-skin texture. When hit with a very strong directional light you can pull out a highlight very nearly the color of the red in the photograph, though. 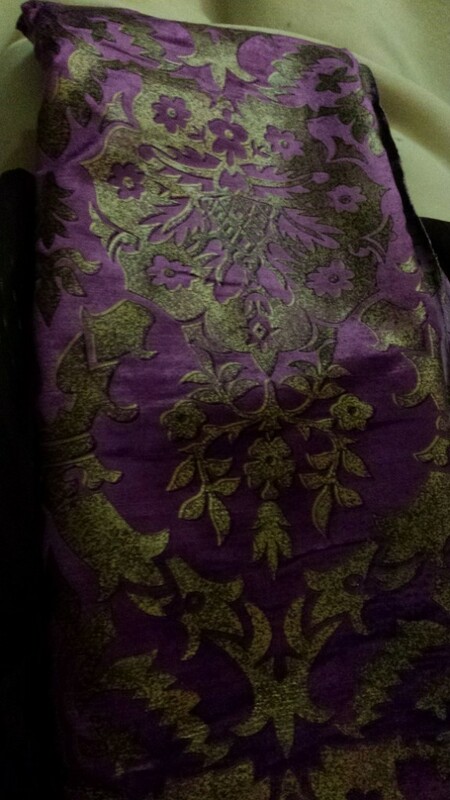 The purple fabric on the other hand has a velveteen texture, and is a very stiff fabric without much drape to it at all. 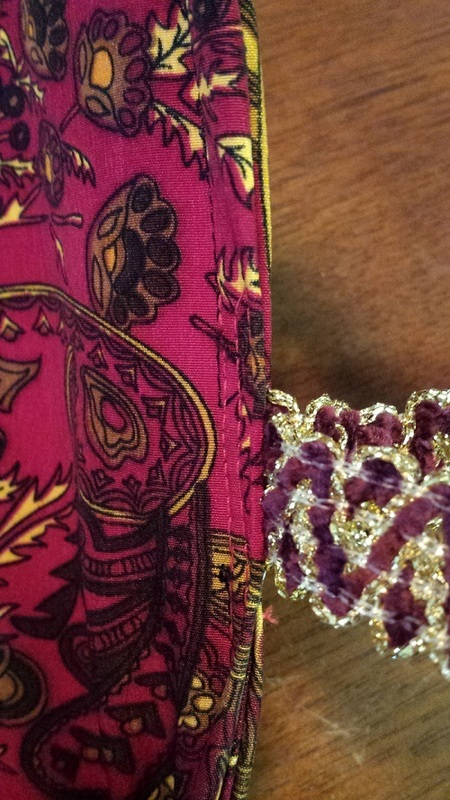 We liked how it looked like a cross between velvet and tapestry. And the directionality of the pattern lends itself really well to vertical paneling. 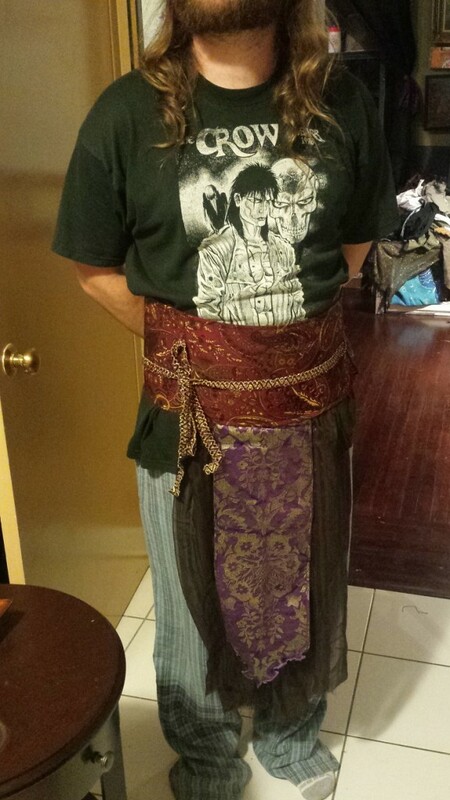 I was not so fortunate with the purple fabric. Thankfully what I think of as a mistake actually causes the light to fall on it in a rather pleasing fashion, and makes the otherwise stiff fabric actually look like it drapes. I am rather pleased with how I was able to sew along the edge of the pattern and trim it close to give the bottom a more interesting outline than just a chevron. I think I’m going to need to treat it with a no-fray glue to make sure that as it ages it retains the details of the hooks and fleur-de-lis shape. 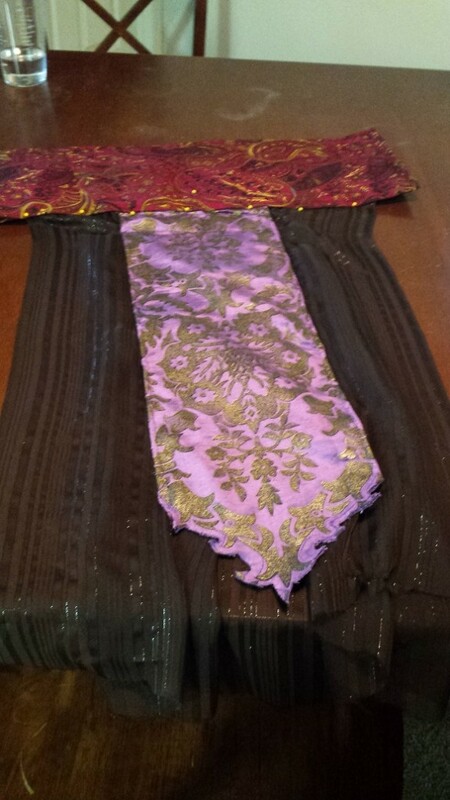 To make the purple panel really pop no matter what color it’s worn over I decided to back it with a neutral colored semi-sheer fabric. 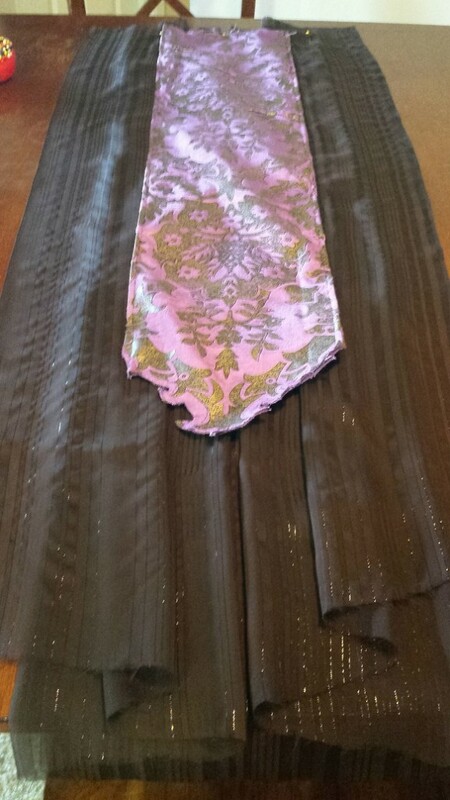 The fabric I found for this had a really lovely texture of alternating rows of sheer and satin, with a highly reflective black synthetic thread woven into the borders of the pattern. I adored the way it sparkles when the light hits it just right, but otherwise it’s a rather unassuming looking fabric. 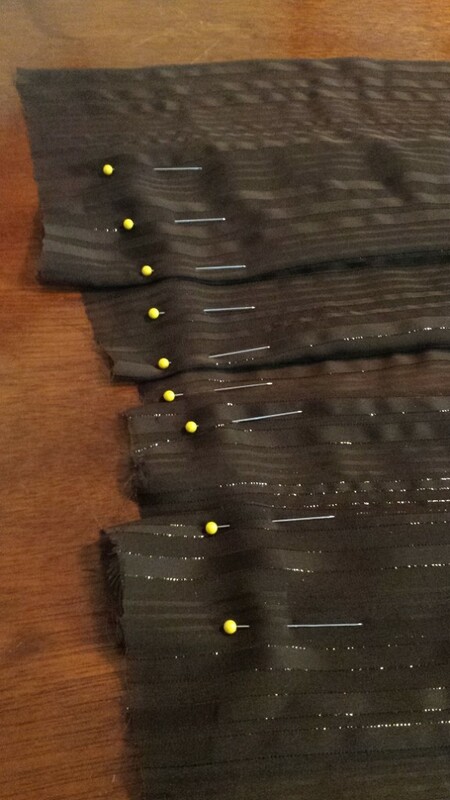 I was really excited to see how nice it looked when it was deeply pleated the way my original design called for. 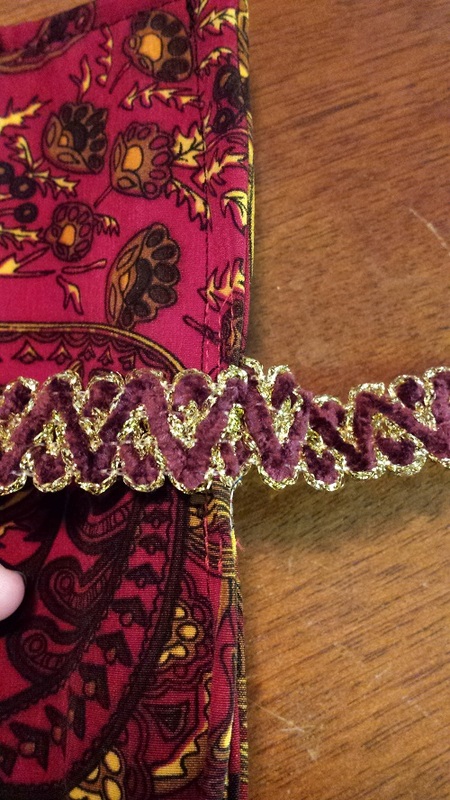 And finally here’s how it looks pinned into the main body of the belt. 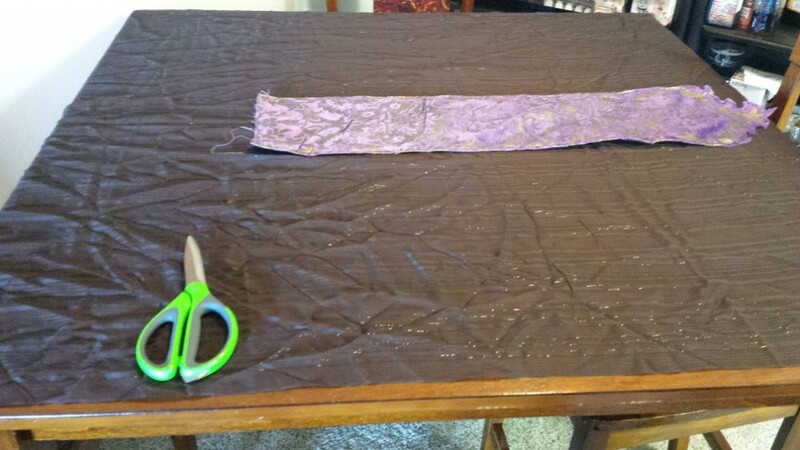 Something I forgot to mention is that I left a gap in the seam between lining and interfacing so that I could sew in these panels without having any ragged edges poking out, technically making the thing reversible, but you wouldn’t see the pretty purple panel if you reversed it. After some back and forth with the lucky owner to be of this epic sash, we decided that it should fasten itself on instead of needing a separate belt to hold it up. We decided to go with a narrow tie on wrap that centers the drape of extra tie-cords over the wearer’s right hip. And here it is demonstrated over pajamas! Those sure are some fancy pajamas. Wow! Tagged Accessory, design, photo, sewing, wizard.